The first full school chapel of the 2018-2019 school year at Trinity College School was dedicated to recognizing our student leaders and the crucial role of service within our school community. 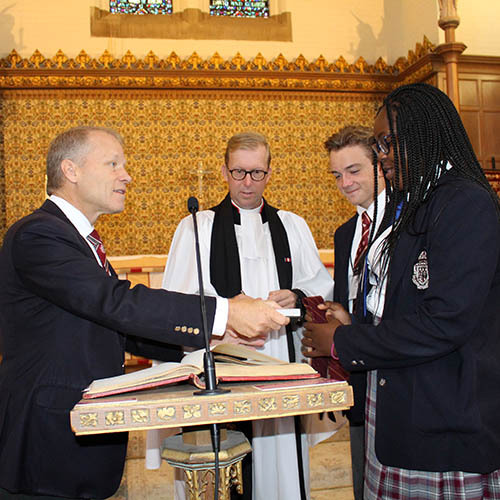 Led by Canon Don Aitchison, the service held Monday, September 10th brought Junior and Senior School students together in the Memorial Chapel. Readings focused on the theme of leadership through service: how each of us has a role to play in the service of others and in doing so becomes a leader. At the same time, students holding formal leadership positions in the School received a tie denoting that role. This included our school prefects, peer support and house leaders, who were each asked to make a commitment to supporting the values of TCS. In turn, all students pledged their support for the new student leaders. Our 2018-2019 prefects are Zororo Mutomba (head girl), Ben Traugott (head boy), Mikayla Estrella, Claire Gardiner, Magnus Jin, Sydney Keiser, Tenzin Mahabir, Hallie Paddock, Bella Savard, Elie Spoor, Pau Valiente and Andrew Youssef. View the Student Leadership Chapel ’18 gallery for more photos.